If you wish to get the print edition of National Geographic within Canada, it will cost you $24 for the full-year subscription, meaning each publication will work out to costing you only $2 a magazine. 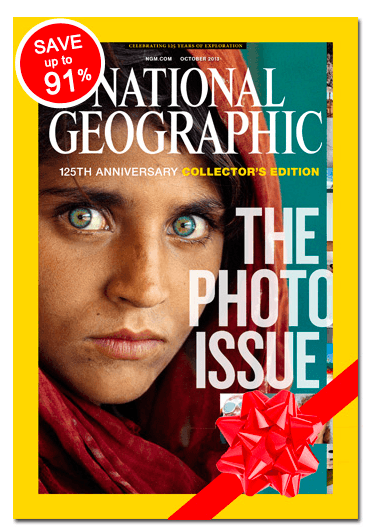 Alternatively, if you’d like to get the National Geographic Print Plus edition, then you can get it both for yourself and as a gift to a friend and you will both receive the print edition, the digital edition, and gain access to the online archive. This offer is only $26, meaning that each print plus subscription will only cost you $13. For a full-year subscription to National Geographic, as a print edition, you would normally pay $79.95 American, which works out to being a value of $91.39 Canadian. If you opt in for the 2 Print Plus Editions, then you would only be paying about 30% of the retail price for a single subscription but you’d be getting two subscriptions. This is an excellent offer no matter which way you cut it, and will only be available for a limited time. Click here to get the print or digital edition of National Geographic, or click here to get the National Geographic Print Plus edition for you and a friend. I wish to subscribe for $24.